A unique moment has presented itself where a majority of the Middle East has had enough of Qatar's promiscuous foreign policy. When a crisis arises, it is only natural to call for calm. In most cases it is a laudable reflex, especially when one is not the cause of the consternation. In the case of the recent Gulf crisis with Qatar, President Trump, the majority of the Arab world, and even most of his detractors, appear to share the same goal, which is to bring Qatar into the wider regional alliance that is aligned against Iran and Sunni extremists. The visions diverge over the strategy to do so. One view places a premium on creating immediate calm and papering over their differences. The thinking is that since Qatar hosts the forward-operating base for U.S. Central Command at Al Udeid Air Base, is home to about eleven thousand American troops, and hosts the only airfield in the region capable of handling B-52 bombers, any open rift with Qatar risks far more downside. It is further argued that since Iran is the greater regional strategic threat to the United States, then it's better to keep the Sunni bloc focused on external challenges rather than forming a circular firing squad. Besides, the fact that Saudi Arabia is calling out the tiny Gulf emirate for supporting jihadis is a little rich given their own support for the Salafi and Wahhabi strands of Islam. Another viewpoint sees the regional kerfuffle as a positive development, emphasizing the new leaf turned over with Gulf and Sunni-majority Arab states finally putting their house in order. Their recent alliance appears to be a response, in part, to President Trump's speech last month in Riyadh. While standing before the representatives of some fifty-five Muslim-majority countries, Trump implored them to "drive out" the Islamist extremists from within their midst. 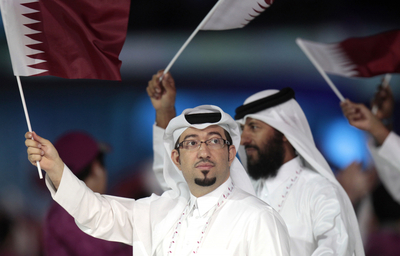 They further argue that one has to start somewhere and it might as well be with Qatar. After all, the challenge posed by the Islamic State is no less urgent than that presented by the Islamic Republic of Iran. If the tide is currently flowing against the Sunni radicals rather than the Shia, so be it. There exists, however, a third option. It recognizes the importance of Qatar in a regional alliance but understands a unique moment has presented itself where a majority of the region has had enough of Qatar's promiscuous foreign policy. That leverage can be used to apply pressure on Qatar's ruling Al Thani family. The diplomatic and economic squeeze should be temporary—but not appear as such—and should be designed to present the gas-rich monarchy with a stark choice. Qatar must come to realize that the cost of continuing to conduct their business as usual is prohibitive. As such, they are welcome onboard, but not if they're going to row in the opposite direction. President Trump selected the third option, and from the outset of the crisis the administration seemed to be singing the same song. On June 5, a professorial Secretary of State Rex Tillerson noted that the growing list of "irritants" involving the wider region and Qatar had long been simmering and he could appreciate why they had "bubbled up" to the surface. Secretary of Defense James Mattis reassuringly chimed in, saying, "I am confident there will be no implications coming out of the diplomatic situation at all," referring to any negative impact on U.S. military operations in the Middle East. While one can debate the efficacy of conducting American statecraft by 140-character tweet, the president took to Twitter with a message of support for Saudi Arabia, referring to his recent visit to the region: "They said they would take a hard line on funding extremism," he wrote, "and all reference was pointing to Qatar. Perhaps this will be the beginning of the end to the horror of terrorism!" Not only did the administration sound like they were singing the same song, they seemed to be harmonizing with each other like a barbershop quartet. Unfortunately, the harmonic convergence didn't last. The discordant note was sounded later in the week when Tillerson called on the Saudi-led coalition "to ease the blockade against Qatar" immediately, which was "hindering U.S. military action in the region, and the campaign against ISIS." The statement was not only at odds with what Mattis said, but Tillerson was contradicted within hours by the president during a press conference. Trump reaffirmed that Qatar "has historically been a funder of terrorism at a very high level" and demanded an end to their financial support of extremist groups. Indeed, while Tillerson called for "no further escalation," President Trump was ramping up the pressure. Further underscoring the divide in the administration, the U.S. ambassador to Qatar, Dana Shell Smith, announced her resignation Tuesday. The fact is—as Tillerson initially seemed to understand—there are real reasons the irritants with Qatar were bubbling up. More than anything else, from the perspective of the regional actors aligned with the Saudi Arabia and the United States, it is Qatar's simultaneous and contradictory support for Iran and the Muslim Brotherhood—including their terrorist cousin, Hamas—that has been such a thorn in the collective Arab side. It's not because Cupid's arrow struck the Arab world and they suddenly fell in love with Israel; it is because they consider both Iran and Sunni extremists to be dangerous revisionists seeking to remake the region in their mutually exclusive images. In either scenario, they all lose. And there is Qatar, like an uncoordinated child attempting to juggle fire atop a keg of dynamite, too foolish to grasp the consequences. Trump has the right inclination and seems to understand that negotiating leverage is best not to be tossed aside—especially when it is given as a gift. The unified stance against Qatar's duplicitous foreign policy is because of a rare thing in the Middle East called "shared interests," which happens to be the exact phrase the president used in Riyadh to outline the basis for a partnership with the United States. The appropriate response is to celebrate and encourage those shared interests, not act like an old upstairs neighbor slamming on the floorboards for the whippersnappers to keep it down. For now, the president should resist Tillerson's urge to call for calm at any cost. A rush to reestablish the status quo would squander a golden opportunity to change Qatar's problematic behavior and send a mixed message to America's allies who appear to be doing precisely what the president asked of them.